Keen observers of this site will note that it has been a while since I’ve posted anything here. I’ve been lucky to write for such sites as The Footy Almanac and Balcony Banter about Footy and Cricket. I also got a piece published in Inside Football which was a lot of fun. Hopefully there will be more to come. 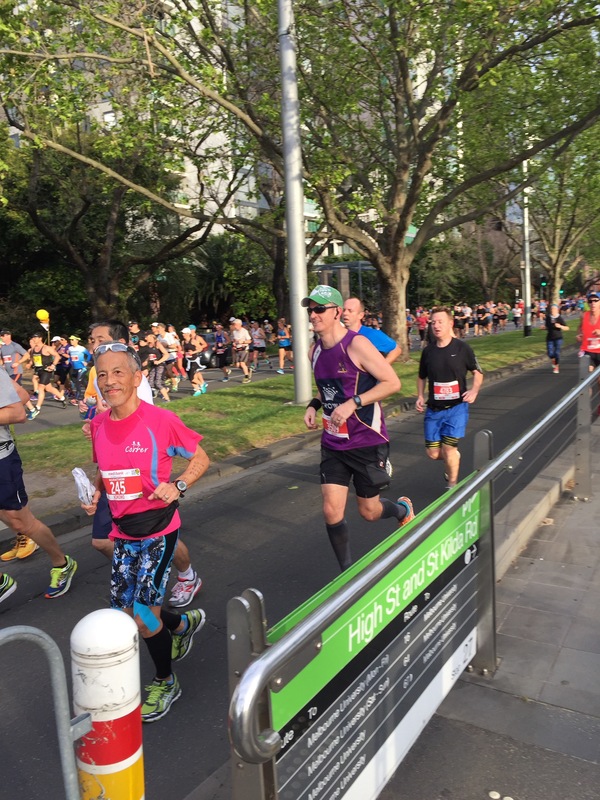 I had started putting something together for the Almanac about an event I participated in a couple of weeks ago – the Melbourne Marathon. But, it turned into more of a stream of consciousness than an article that deserved publishing on a proper writing site, so I thought I’d change tack and put this up here as a bit of a diary piece recording for all time my thoughts about the weekend, a “thank you” or two, as well as a few of the great photos Geri took! Of course, some of you will know that this blog shouldn’t exist – because I’ve repeatedly said that I wouldn’t run further, and then gone back on my comments. Back in 2013 when I first started entering organised running events, Geri (who at that stage was my girlfriend) asked me “Have you ever thought about trying a half marathon” to which I replied words to the effect of “No, I could never do that. I won’t be entering one of those…”. 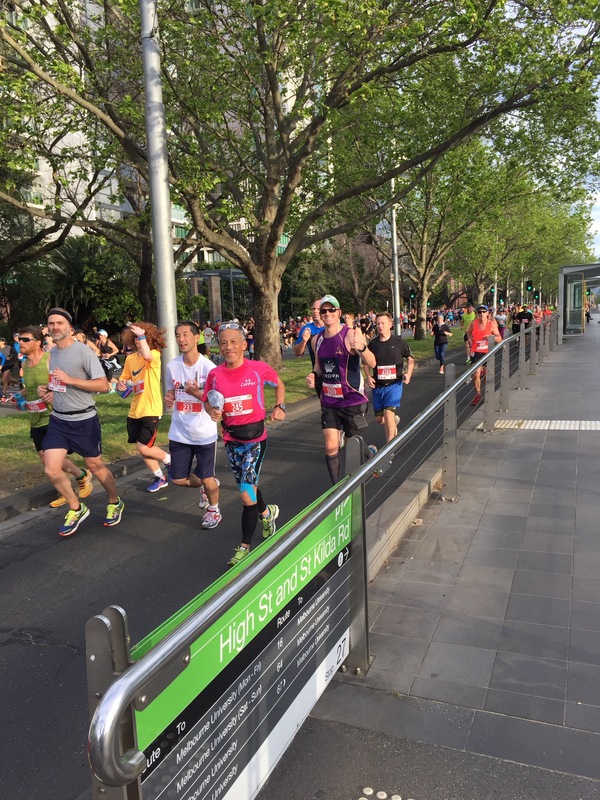 But… I ran my first half marathon at “Run Melbourne” in 2014. I ran another half marathon in August 2015 and beat that time. For amateurs like me, running in events like these are both competitive and non-competitive all at the same time. You’re not necessarily trying to go faster than the others, the aim is to race against goals you have set for yourself. That’s one of the things I really like about running – taking the chance to push yourself further to achieve more based on your own standards. I started running with an aim to complete a 5km event. Then the next event was slightly longer. I then tried even longer distances, graduated to a half marathon, and then tried to beat that time. It didn’t matter that I was nowhere near the front of the field – my only opponent was myself. As you can tell from this post, I was wrong about that too! I’ll be honest with you, the idea of running onto the MCG to complete a marathon was probably the biggest factor in my choosing to enter this event. As a Victorian kid, I would mostly dream of doing something amazing on the MCG – hitting 100 on Boxing Day or playing for my favourite team, Melbourne. But now, I’m a 37-year-old office worker who is far better at watching sport than playing it. I thought my sports achievements were done and dusted. The concept that I could ever achieve anything in a running event was even more preposterous. Testing whether I could cover the longest Olympic distance would a far bigger step (both literally and figuratively) than jumping from 5km to 10km. I just wanted to give myself one crack at it to see if I could do it. But, as a safety measure, I also diarised the mid-September cut-off date for dropping back to a shorter distance if my training wasn’t going well! 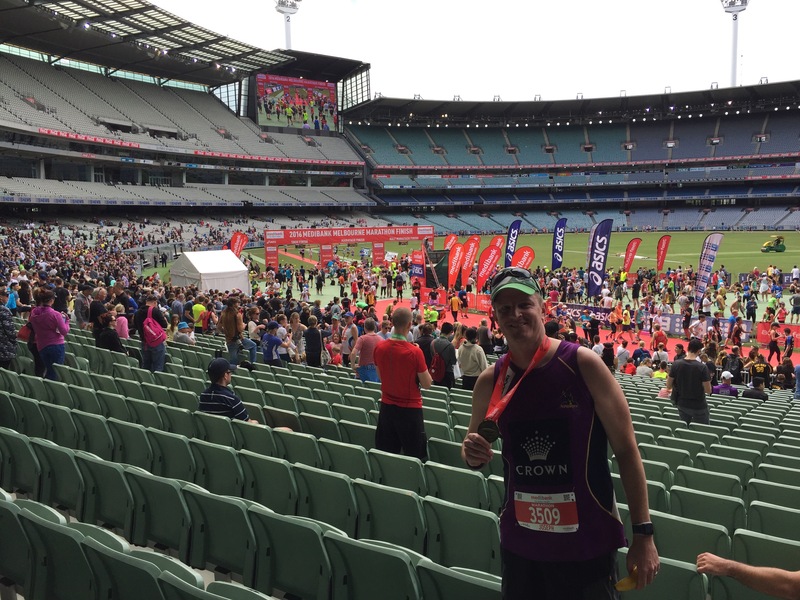 I ran the half marathon at Run Melbourne again in July, and recorded a personal best, so things were going well. My mate Lenny said he was considering entering and that gave me further impetus to continue the training (he later had to pull out due to illness). In late July, I revealed to Geri (now my wife) that I was considering doing the Marathon and she promptly reminded me of my past comments! But, she was supportive of my efforts, tolerated my long training runs – I did a few runs around the 20-25km range, and got up to 31km in my longest training run. She even offered to follow me around the course on her bike on the big day. I told a couple of people that I was running the marathon, and a few people who follow me on Strava worked it out when they saw me taking longer training runs. I didn’t actually make it public (well, post it on Instagram) that I was running the marathon until the bib arrived in the mail! Well, let’s deal with the night before first. I was at the NRL Victoria presentation night. As I was telling people about what I was doing the following day, I was called a mix of words including “mad”, “crazy” and “insane”. Dallas Johnson, Melbourne Storm legend, 12 time Origin player and one time Australian representative, called me “tough”. Wow! I was careful with the drinks, staying on the water to the point where the wait staff got sick of refilling the jug, and having one small wine with dinner and that’s it, before making an exit soon after the last trophy was handed out. I somehow managed to sleep reasonably well before the alarm went off at 5.30am. I think that had a lot to do with having a busy night the night before to keep my mind off what was to come the next day. Like most runners, I had all my gear laid out (including the compression socks I like to wear), I had my TomTom sports watch fully charged, and had all my gels, sports drinks, and warm stuff for after the race ready to go. Unlike many runners, I didn’t share a photo of it on Instagram the night before – but I did take a keen interest in what everyone was wearing, how many gels they were carrying, and (in some cases) which sporting team they would be representing. 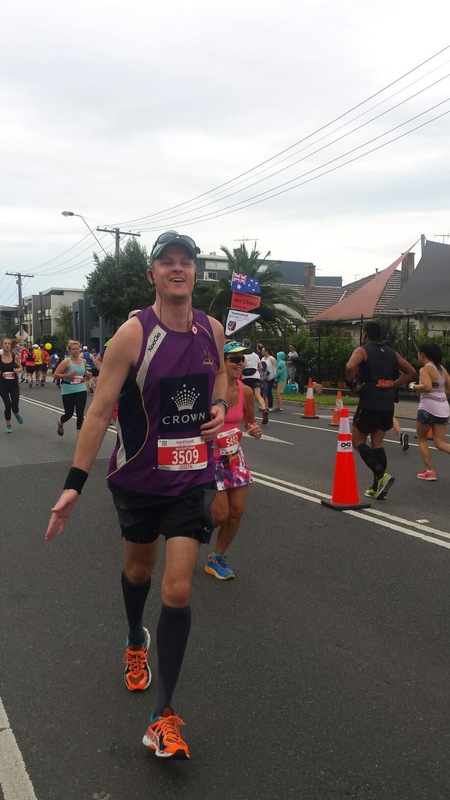 Me, I wore my trusty Melbourne Storm singlet. On arrival at the MCG I started to get nervous. We walked down to the oval near the Tennis Centre. I slapped on some Dencorub and had a quick warm up jog and stretch. Once I got out to Batman Avenue though I began to feel like a proper competitor. They played the national anthem – I think this is the first time I’ve participated in a sporting event which commenced with the national anthem. Makes you feel pretty special! The gun went off and I could see the elite runners heading into the distance. A minute or so passed and then the crowd at our end started to move. We were off! One of the things I didn’t want to do was charge off too quickly and burn energy early. Fortunately there was no danger of that as the big crowd meant I had to keep a steady pace. 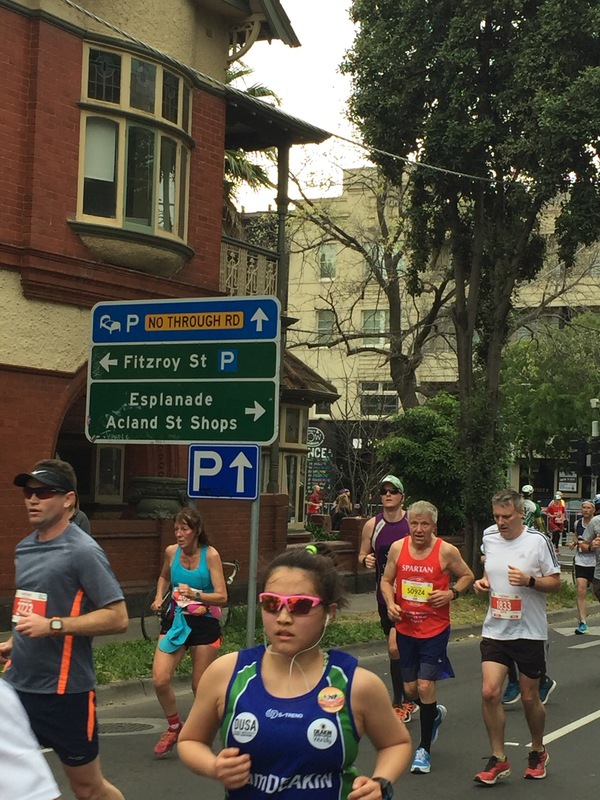 The course went up Exhibition St to Flinders St, then turned left into St.Kilda Road. I was hoping the wind might push as we headed south, and there were a couple of times where you could feel a gust of wind give you a big shove. I kept an eye out for Geri and I eventually saw her ride past on her bike. 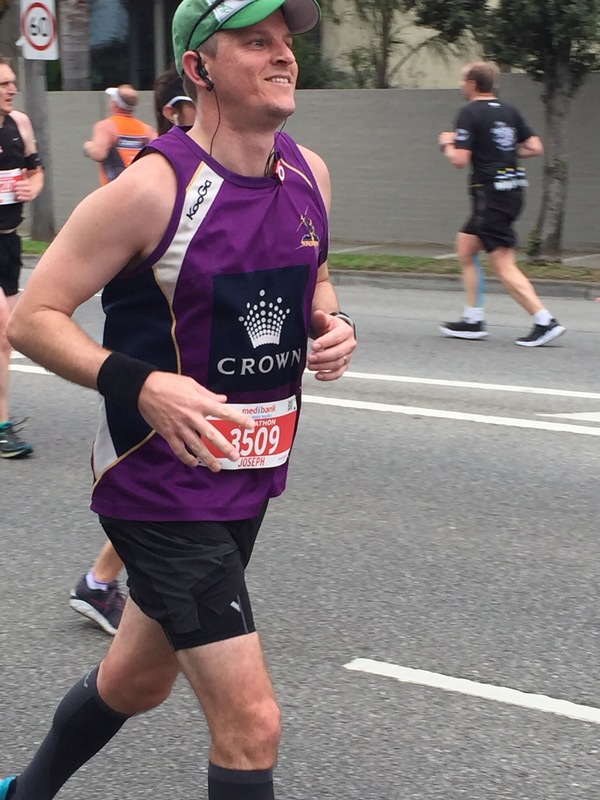 She went a little in front of me and caught this happy snap of me looking steady at around the 5km mark. The course then turns into Fitzroy St, and then again turns right to do a lap of Albert park, with an extra bit tacked on where you head down the pit lane of the grand prix track. You rejoin Fitzroy St and head towards the beach, then turn right to head to Port Melbourne. Geri captured this shot of me as I turned into Beaconsfield Parade. Sorry to have to bring this up, but at about 13km, I needed to go to the toilet. I spent a bit of time wondering whether I could hold on, but when I got uncomfortable heading towards Port Melbourne I started scoping out where the toilets were on the other side of the road. That opportunity was taken at about 19km. It cost me almost two minutes of time but it would have been much worse if I tried to hold on until the end! On the run from St.Kilda to Port Melbourne I could see a few of the runners who were ahead of me coming back on the other side of the road. They all looked fit, calm, and were on pace to beat me by over an hour. Of course, the elite runners were well past this point and already on their way back from Elwood. 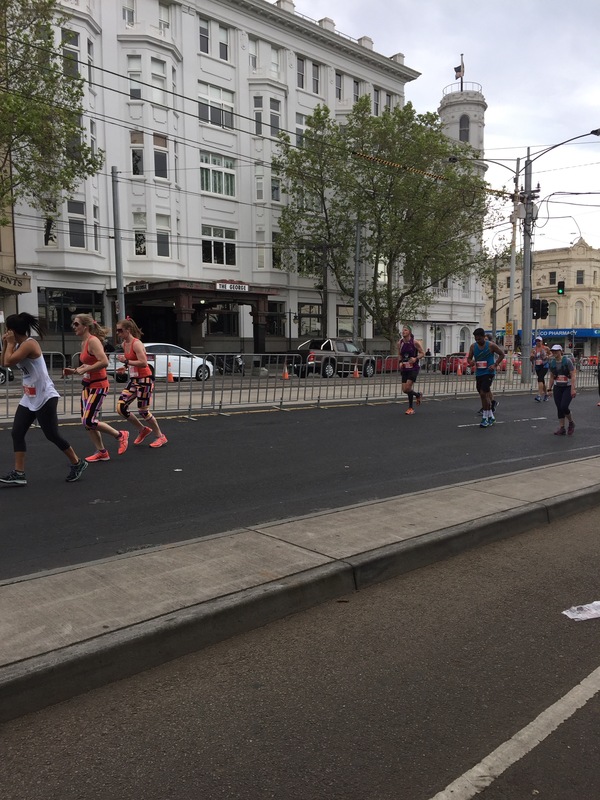 Time wasn’t an issue for me – my aim was to finish, so I kinda enjoyed checking out how they all looked, their running styles, the gels and drinks they were scoffing down. Maybe I could learn from how the better runners went about it? On the run from Port Melbourne to St.Kilda I could see slower runners on the other side of the road. They didn’t look like athletes – but their singlets said otherwise – 25 years of running the marathon, or 35 years. These guys may be a bit older but they were conquering this thing well into their 50s and 60s. Apparently there was an 80+ year old running this race. Phenomenal. They provided a different type of lesson – as long as you’re determined enough then you don’t need to be an elite athlete to run a marathon. Age is just a number, I guess! 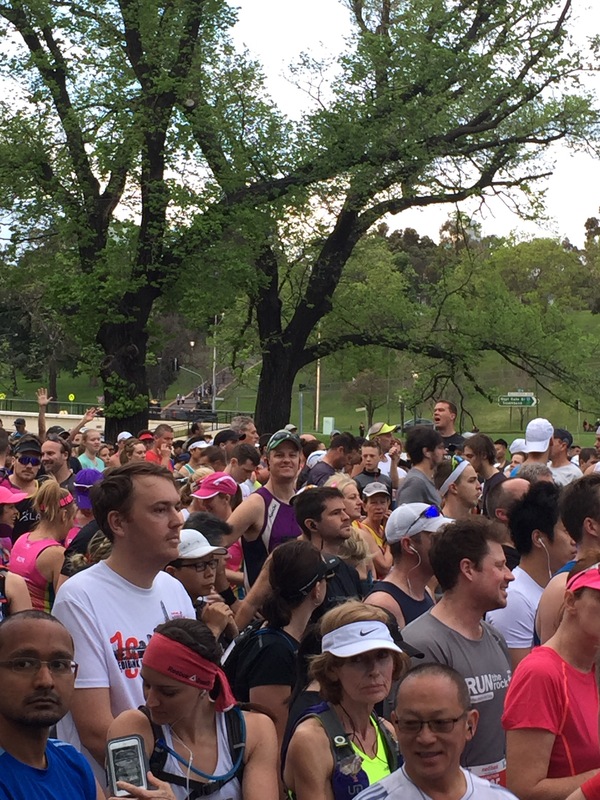 I’d run over 2 1/2 hours, so the elite athletes had already finished their race at the MCG. Yet there were still big crowds lining the streets and cheering for us. Kids were reaching out to give high fives and both spectators and course marshals were handing out lollies. One gave me a big handful of jellybeans which was great! I was a bit overwhelmed that all these people were coming out to watch us nobodies traverse the streets of Melbourne. If they just wanted to see good runners they should have been here over an hour ago – they were all here to watch the amateurs clocking up their own achievements and help them along wherever they could. That made me feel a bit special. At about 26km, approaching Elwood, I saw Geri again who took this pic which makes it look as though I’m cruising. I’ll admit it I was starting to become weary. …and then Chloe who took this one. Chloe says “You’re a Legend Joe” to which the 4hr 20 min pace runner says “Hey, he hasn’t finished yet”. Look, that’s a fair point, but you could be a bit more encouraging!! Then the fun part began. And by “fun” I mean “exhausting”. Uphill and into the wind, heading back to St.Kilda and then to the CBD. The hat was reversed to prevent it blowing off as I ran into the wind! At 30km I checked my watch and I had been running for 3 hours. This was good – I was still on a pretty good pace by my standards, but I knew that a new challenge was approaching for me – uncharted waters. As I turned onto St.Kilda Rd I can recall Geri rode past and said some encouraging words. I can remember saying “This is further than I’ve ever gone before” – and it was – my longest training run was 31km. Everything from here onwards was new territory and would be much harder – especially given we were still working our way into the wind. When I checked my watch again I could see my pace slowing! I never realised how hilly St.Kilda rd was. Okay, I admit, it isn’t, but when you’re a bit exhausted, every gentle uphill incline feels like a mountain and every gentle downhill incline feels like you’re tumbling down a hill! At Sturt St we turned left, to then go around the Arts Centre via City Rd, before joining the Tan running track to head back towards Domain Rd. there was a nice downhill part where I was able to let gravity to do all the work, but as I turned onto city road (it’s about 35km in at this point) I felt my right hamstring cramp up. NOT NOW DAMMIT, NOT NOW!! I stopped briefly and had a stretch. The cramp went away but now I was worried. I didn’t have far to go and didn’t want to stop here. I downed my last energy gel, and started plodding along slowly, heading towards the Tan running track. Making my way along Birdwood Avenue I started to feel a lot better, and the drink station near Government House had electrolyte drinks available so I downed one of them. At 38km I could see Geri in the distance, waving a bottle of water and some lollies. I called out for the water and she, well, walked quickly alongside me as I ‘ran’! I said to Geri that I was just going to keep trying to put one foot in front of the other until I get to the finish. She said “It’s all downhill from here”, which was encouraging! Just to our left at that point was a family giving out Icypoles! A welcome sugar burst for some, but I declined the offer as I was pretty focused on that finish line. Heading up St.Kilda Road again, people were dropping like flies and I was determined not to be one of them. One guy who was threatening to withdraw was being talked to by a friend and as each of us went past we tried to say something encouraging. I hope he pulled through. I then passed a couple of people receiving medical attention at 40km. If felt bad for them – coming so close to the finish before suffering. The course went up to Flinders St again. Was I struggling? The gritted teeth in this photo say “yes”. A few metres further, the professional photographer captured this magnificent shot of me in front of Flinders St Station. We went down Wellington Parade South and turned onto Brunton Avenue. There were big crowds cheering and I just couldn’t wait to get to the MCG. I was starting to tear up a bit, knowing how close I was. As I turned into the tunnel and could see the inside of the MCG I let out a bit of a yell. I was about to achieve one of my greatest personal triumphs on the stage that I had watched so often over many years. When inside the stadium I tried to soak up as much as I could, but after 42km of staying strong and pushing myself forward, the emotion got the better of me. There were fist pumps. There were some tears. And then finally there was this. I’d try to describe what this feeling is like but I think the picture describes it better than I ever could. I was pretty happy with that, although to be fair my aim was mainly to finish and if I somehow beat 4 1/2 hours I’d be thrilled (success by 24 seconds!). Some mates of mine – you know who you are – beat me by almost an hour, and in one case over an hour and a half! Superb efforts gents! Here’s the map showing how I traversed 42+ kilometres throughout Melbourne only to end up a few hundred metres away from where I started! Keen observers will note that the Strava time is quicker than my official time because it doesn’t count the toilet stop! Also here’s a link to my Map My Run page. Nick, Simon and Fiona at work for the pre-race chats and encouragement during the training weeks. Chris, Rhett and Chloe for the pre race messages, and Ashley (twitter follower who I’ve never met) for the good luck tweet! Shelley and Chloe for making the effort to get up on a Sunday to come and watch me run. Geri for being the roving support crew, chief photographer, supplier of drinks, taxi home. for going into Bunnings to buy me a piece of PVC pipe that I could use as a roller to massage my legs later that day, and for just generally being awesome. I’m thinking that my way of giving back might be to play the same support role for someone next year, that Geri played for me. Any friends who are thinking of doing their first marathon and would like a roving support crew on the course, let me know? I did say that I wanted to do this once, just to say that I had covered the distance. I can now tick that item off my bucket list! But Geri’s right – I love doing this and the buzz I get from it will probably bring me back again at some point. 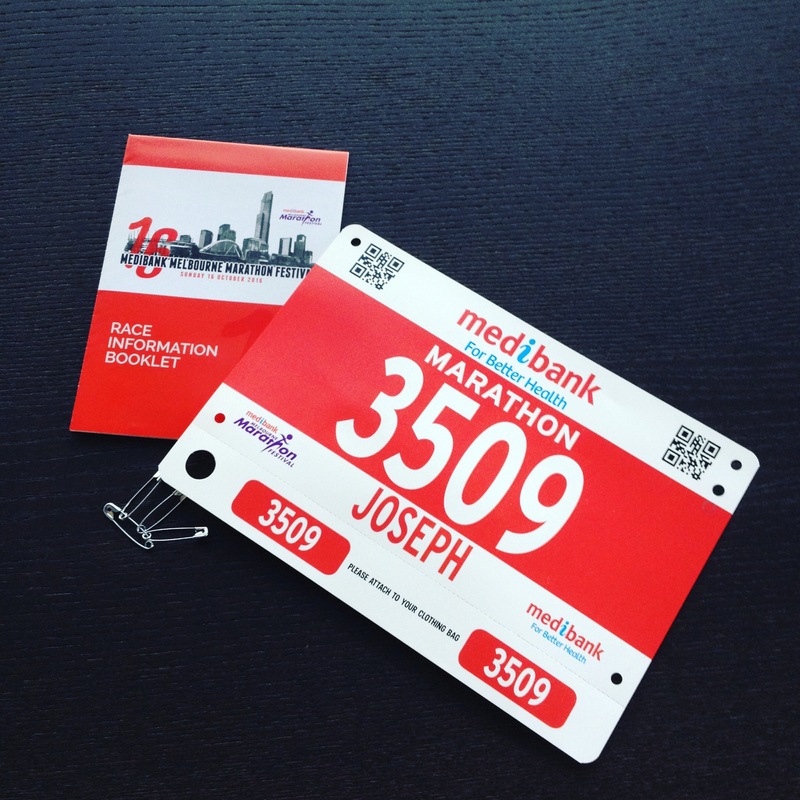 I won’t commit to another one, either next year or any other year for that matter, or running in Melbourne again, but I’m already on the lookout for another challenge. It’s a busy work year next year – so maybe travelling for a half marathon might be a better aim to train for? Regardless of what I choose I can look back on this with pride. 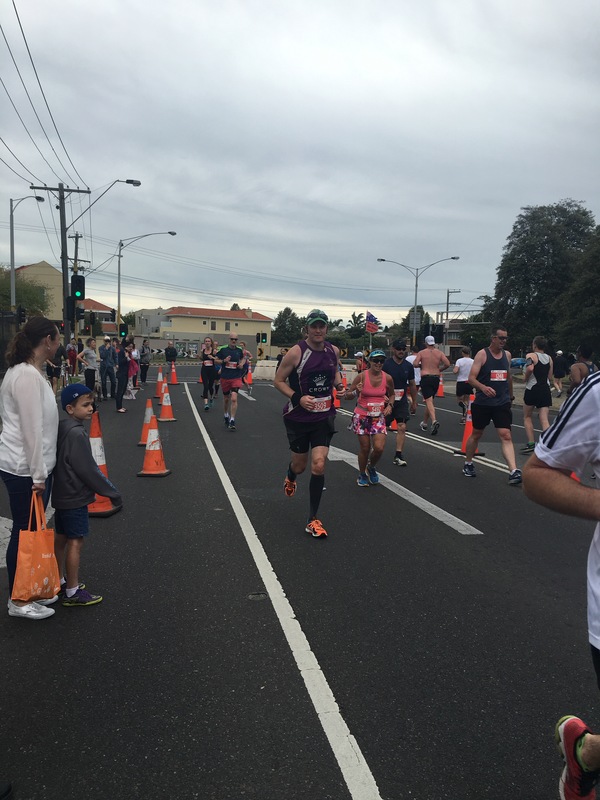 I can say I completed the Melbourne Marathon, and it made me, a rank amateur sportsperson, feel like a bloody hero. I loved every minute. 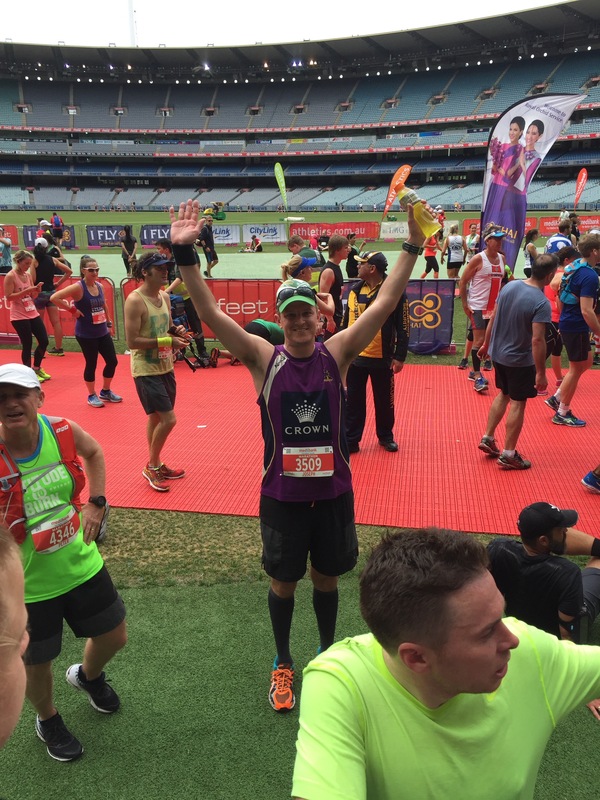 This entry was posted in Running and tagged marathon, MCG, Melbourne, melbourne marathon, melbourne storm, running. Bookmark the permalink.